During the latter part of the 17th century the discovery of phosphorus intrigued and challenged the established ideas of alchemy. Suddenly, alchemists were able to prepare a substance which shone in the dark and often spontaneously burst into flame. A number of books were written on the subject. 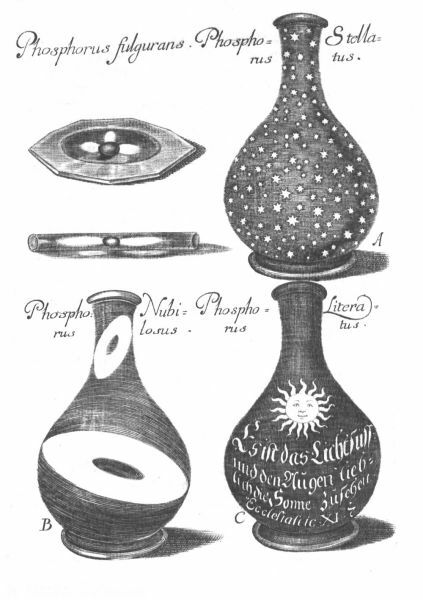 Here is an interesting engraving from Johann Sigismund Elsholtz, De Phosphoris observationes, Berlin 1681. Four aspects of phosphorus are shown. Top left, flashing or scintillating phosphorus on an open dish or within a glass tube. Top right, starry phosphorus, sublimed onto the inner surface of a flask and shining like stars. Bottom left, cloudy phosphorus, in a flask surrounded by clouds of fumes. Finally on the bottom right is phosphorus in literature with a quotation from Ecclesiastes 11, 7 "Light is sweet, and it pleases the eyes to see the sun".